Enjoy a session in a classic British boozer without having to worry about a hangover or that strange bloke who looks like he wants to smash everyone’s face in. 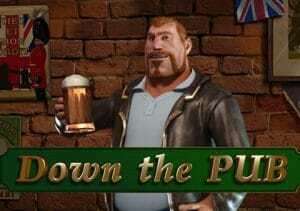 Down The Pub is a 5 reel, 15 payline game from Playson. It comes with a one-arm bandit style mini feature as well as a free spins round with multipliers. Get supping on all devices from between 30p and £75 per spin. This pub has a welcoming feel – the setting is a typical bar complete with a rotund regular nursing a drink. You’ll see a selection of beer mats with the letters B, O, N, U and S spinning around the reels alongside bar snacks, glasses of whisky and beer. Bonus Game feature – this is triggered when the letters BONUS spell out in order across all 5 reels. You’ll then be taken to a new one-arm bandit which features plums, oranges, lemons and wild 7s. There’s a trail round the outside of these mini reels. Depending on where the light lands, you could get a nudge, a shift which creates a new combination, a multiplier or a jackpot. Watch out for the bombs – land on 1 of these and you lose a life. On each spin, the number of bombs on the trail increases. The multiplier prizes and other goodies increase too though. The top prize comes from the lemons which pay 3 times your stake if you land 3 in a row. Multipliers can top 5x here too. Keep on spinning until you lose all 3 of your lives. Free Spins feature – this is triggered by landing 3, 4 or 5 of the scatter. As well as a payout of 2, 20 or 100 times your total stake, you’ll also receive an undefined number of free spins. Keep a special eye out for the pint pot symbol in the middle reel. The first time one lands, it activates a 2x multiplier. When the second lands, the multiplier increases to 3x. When the third pint pot hits, you’ll receive 1 more free spin. That spin comes with a 10x multiplier. The maximum number of potential free spins here is 70. You can land the other feature from within the free spins too. This visit Down The Pub is an enjoyable one. The imagery is well put together and there’s a good range of extras on offer. The one-armed bandit mini game is a perfect fit for the theme and the free spins have decent potential. This is an unusual game but one that works pretty well. Take a virtual trip Down The Pub and you should get a warm welcome. I also urge you to try Playson’s Eastern Delights which is their best video slot in my opinion.